This letter was written by the Heartware 2014 Organizing Team in response to an opinion-editorial piece contributed by one of our readers. You can read the original piece (Acta Non Verba: One Day Without Shoes) here. No Shoes Day is just around the corner (Thursday, 17 April). An annual initiative by the Raffles Community Advocates, this event aims to raise awareness about the issue of poverty in developing nations. The act of taking off one’s shoes for a day has become a key feature of CA’s advocacy efforts, and will hopefully become a lasting tradition. However, we are aware that concerns have been raised about the usefulness of the project, and would like to take this opportunity to answer any questions or doubts that you may have. A key concern raised in the recently posted article is that the influx of donated foreign-made shoes will destroy local cottage industries, causing local shoemakers to lose their jobs, resulting in the local community becoming over-dependent on foreign shoes. Based on our own research as well as discussions with our partner organization, the Tana River Life Foundation (TRLF), we are glad to share that the upcoming shoe donation drive will not threaten the livelihood of local communities. Most importantly, the part of Africa the shoes are being sent to does not have a significant shoe-making industry. The shoes are going to the Tana River County, specifically the village of Isdowe. This village relies almost exclusively on agriculture, with the majority of villagers being farmers – it does not have a local cottage industry to make shoes. 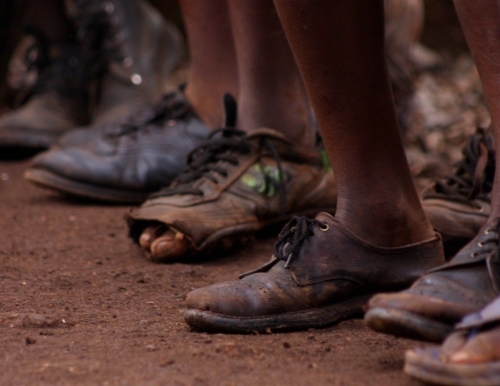 When villagers do buy shoes, the shoes are likely to come from larger manufacturing businesses located in larger cities in Kenya such as Mombasa and Nairobi. These manufacturing businesses, being much larger, are less threatened by donations of shoes. In particular, the limited number of shoes we donate every year (a few hundred) will not cripple local industries. Rather, the real problem is with large multi-national corporations, such as TOMS, which routinely and unscrupulously dump enormous numbers of shoes, along with a massive influx of cheap Chinese imports. This larger problem of Chinese imports will only be solved through economic policy, such as by the imposition of higher tariffs, or with World Trade Organization agreements. The number of shoes, as well as the breakdown of local industries, needs to be taken into context in examining this project; in particular, one needs to balance whether the shoes donated will do more harm or good. As elaborated upon below, the small number of shoes donated through the TRLF do significantly benefit local villagers. Rather than simply introducing a free handout that encourages a dependency on foreign imports, the shoes serve to encourage entrepreneurship and create business in the local industry. The Mitumba project serves more as a microfinance scheme, providing capital for local entrepreneurs as well as providing the training and business skills they need to succeed. This is because, instead of just handing out the shoes, the shoes are sold to local villagers who pay $0.50 for each pair of shoes. They then receive entrepreneurship training, learning how to sell and market the shoes. The villagers, who then sell the shoes at $2.50 per pair, can then go on to use these skills to run businesses in the future. Without entrepreneurial skills, many local businesses in fact fail due to poor management. The TRLF views this as a way to help villagers in a sustainable way that respects their dignity and self-sufficiency. The payment for the shoes is treated much like a bank loan, which must be paid back; indeed, all beneficiaries last year had excellent credit discipline with no bad debts, and they submitted receipts to prove that the supplementary income was used to send their children to school. The 56 beneficiaries of the project were in fact women whose main profession is farming – without the skills provided them to run a business on the side, they would not have had enough additional money for education. Moreover, the shoe donations to TRLF benefit the local community there in many long-term ways, going beyond the immediate donation of shoes. The Tana River Life Foundation has many other projects to benefit the local community, of which this project is only one. Out of the shoes donated, the shoes which are broken, old, or cannot be used, are first sold to the garang guni or sold in jumble sales in Singapore. Last year, sales made to the garang guni made S$1457, and the jumble sales raised S$5569. TRLF in fact places much more focus on this money raised as opposed to providing the villagers with shoes. Rather than this money simply being a handout, the Foundation invests this money in the local infrastructure, building schools, providing mobile libraries and improving classrooms, and rebuilding farms that were destroyed in floods. An example of how they improve local education would be by setting up the Delta Mustard Seed Academy, which educates 115 children of the Tana Delta river tribes. The entrepreneurship scheme is not only extended to the women who sell the shoes; training is also given to local youths to set up and run small businesses, learning trades such as mobile phone repairing. As the author of “Acta non verba” rightly pointed out, the correct way to help poor economies is through the introduction of capital, training, and infrastructure, which creates jobs and an independent economy. Most importantly, it gives the villagers dignity, and a way to break out of the cycle themselves. No Shoes Day can indeed be seen as “slacktivism”, as it is true that taking off one’s shoes may just be a “feel good” gesture, that does not directly benefit the Kenyan locals. However, we hope that through this publicity gesture, we will generate greater meaningful debate about helping developing countries, and the ways in which one can help. Those participating can contribute by explaining the project and donating shoes. Hopefully, the participants will find it meaningful enough to be inspired to find more direct ways to help. We hope that everyone who participates in No Shoes Day and in Heartware 2014 can better appreciate the little things we have around us. We appreciate alternative viewpoints on this project, as well as on the wider event of Heartware 2014. Thank you for generating debate and giving us a chance to explain No Shoes Day, and we look forward to more discussion on the concerns raised. Excita acta probat: we hope that the outcomes of our work will speak for us. Mr Gabriel Teo the founder of Tana River Life Foundation will be coming down to RI on Wednesday, 16th April 2014 (tomorrow) to give a talk about the foundation and what projects they are currently embarking on. Accompanying him will be three Kenyan youths. Please drop by LT6 (Block J) from 2.30-3.30pm if you are free!